Oh my goodness, I’m seriously behind schedule here. I keep not getting things done during the week (i.e. not posting) and then I’m faced with a mountain of restaurant recaps and recipes. So! To tidy things up, I’m going to do my darndest to wrap-up everything before March, March 5 at the latest. That way I’ll be fresh & ready for Europe (be still my excited heart)! Thus the final Raleigh post. Before we went to the opera, we caught dinner at, perhaps, the best restaurant in Raleigh–J Betski’s. I say “probably” because, well, I don’t know if it’s the best, but it’s one of the top meals I’ve eaten in the past year. I found J Betski’s through the usual Yelp/internet searching, and something about it’s modern twist on traditional German and Eastern European dishes tugged at my heartstrings. We showed up a little late for our reservation, but they held the table for 15 minutes, which was great considering that the entire dining room was full–packed to the gills. But I wasn’t digging the table. It was a two-top right next to the hostess stand and door and felt too out-in-the-open, plus the dining room was mostly full of older couples and groups and I just felt a little out of place. So we opted for the bar–a great choice and one I hands-down recommend as the bartender was the perfect mix of professional and friendly. Chatting with him was great, plus he really knew the food and pointed us in some great directions. Trying to stay gluten-free, G wasn’t keen on ordering plates but then not eating main components on them, but we found a few dishes that hit the gluten-free spot. 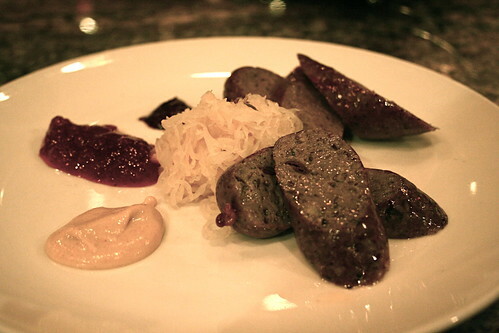 We started with the sausage special of the night:Duck and Venison Sausage with in-house Sauerkraut, a spicy yellow mustard, redcurrant jam, and a mustard from France with grape skins in it (a really excellent mustard). The sausages, though, were incredible. We tried to pick our favorite and really couldn’t–the venison was a little more savory, the duck fattier and a little sweeter. If I were eating one for breakfast, I’d go with the venison, but over all I think I liked the juicy darkness of the duck. Bur, for reals, they were both out of this world. And the sauerkraut? I could have eaten a jar of it. At the bar. In under 10 minutes. Fresh and crisp with a tart sourness, it paired perfectly with the sausages and was great on its own. Utter deliciousness. While G is mostly gluten-free right now, I’m not, and I have a ridiculous addiction to spaetzle, so I couldn’t not order the spaetzle with in-house quark. (Quark is a fresh cheese kind of like the curds in cottage cheese–tart and made from soured milk–a little paneer.) 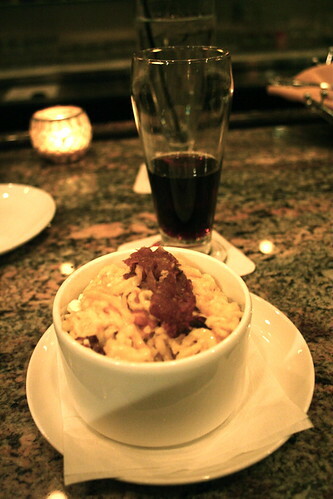 I’m really glad G was ok with me ordering it, because it was all that the bartender said it would be–the spaetzle (made in-house, of course) had the perfect chew, and paired with the quark, it was like a mega rich German mac and cheese. On top, richly caramelized onions completed it, lending a silky buttery sweetness to the mix. Plus, when baked, the cheese and spaetzle were a little browned on the edges and crispy. Heaven. 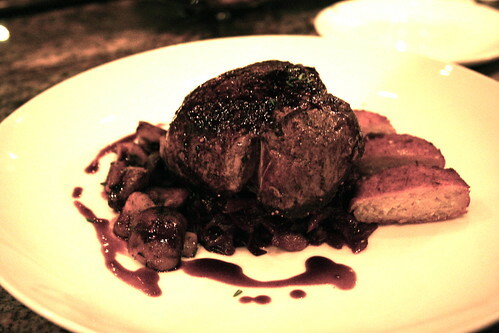 For the main course, the one completely gluten-free option was the Filet Mignon with Sweet & Sour Red Cabbage, Potato Pancakes, and a Mushroom Sauce. I was a little wary of ordering a filet mignon, I mean, it seems like what people order who aren’t adventurous and don’t love food, but the steak was ridiculous. In a good way. In a very, very, very good way. I have no idea how many ounces it was, but it was more than enough to feed the both of us–and for the price, it seemed crazy. I think the dish was only $28 or something like that. It was, of course, cooked a perfectly medium-rare (juicy and rich). Paired with thick potato pancakes unlike any other I’ve tried and a sweet & sour cabbage that I had to fight G for, and with a rich, velvety wine-soused mushroom sauce to boot, the entire plate was the best plate of steak I’ve ever had in my life. It was surreal how good and how generous the portions were. I would have gladly paid the same price for half the food–and still felt like I’d been served a deal. After we raced to the opera (literally–we had the wrong directions and had to scream to the other side of town and then run across the Symphony Hall’s lawn to get there by curtain), we moseyed downtown and found Foundation, a wicked little whiskey bar. It’s a basement bar and thus a little hard to find, but thankfully we did, and we spent the evening nursing sazeracs of various types. Cave-like and warm, it was hard to peel myself from the place, especially after we scored seats at the bar. 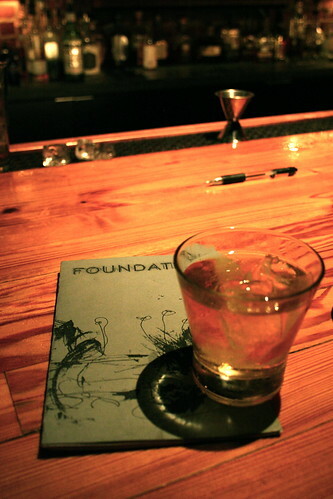 Just watching the bartenders work was art–and all the whiskeys? I’d kill for a bar like that in Roanoke. Be warned, though, if it’s a busy night, you might have to wait outside for awhile. They cap it at a certain number, for fire standards or for comfort, I’m not sure, but the cap ensures a pleasant, not-too-crowded experience at the bar. The next day, after breakfasting at a not-too-remarkable place and scoring huge on veggies and other goodies at the North Carolina State Farmers Market, we met up for an early dinner with my former roommate A who shared the first house I lived in Roanoke with me. 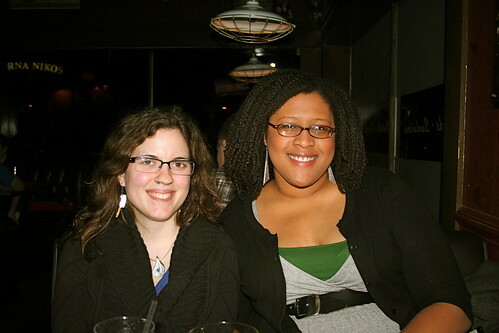 She lives in Durham now and I hadn’t seen her since our first year of the MFA program (she left the program for bigger & better things), so it was great to catch up and enjoy a brew and some great pub food at The Federal. Deciding what to order was a doozy, but we all agreed we needed to split a bowl of Mussels in a spicy tomato broth with chorizo & frites. I haven’t had mussels in awhile (last year I couldn’t get enough of them), and these mussels were damn fine–slightly spicy and perfect with the smoky chorizo, it was hard not to mow down on all of them. 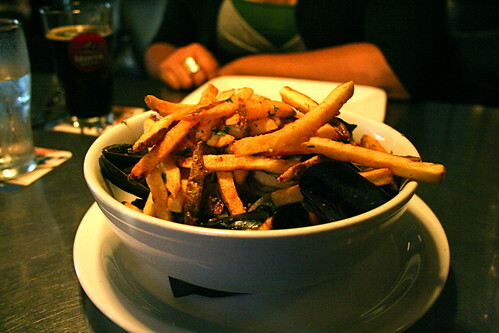 Plus the frites were incredible–crunchy and salty and tasting like a fresh potato, they were phenomenal when dredged in the broth. For my dinner, I chose the Veggie Sliders with a side salad, which A said she’d heard were really good for veggie burgers. 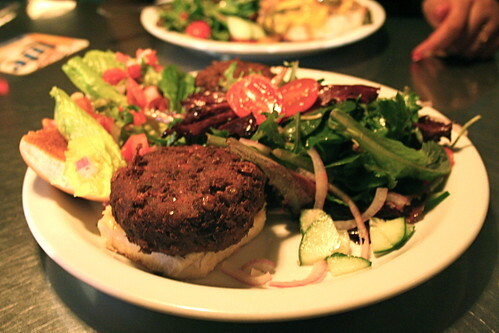 A bean base, they were really good, a little like falafel, but that’s never a bad thing in my book. The plate came with two medium-sized sliders and heaping portion of mixed greens and I honestly couldn’t finish it all. It was delicious but just too much food. Not sure on the vegan status of them, as I didn’t ask, but even if they aren’t, they fit the bill for a veggie burger not stuffed with wheat or rice filler that’s more focused on beans, vegetables, and overall goodness. Definitely recommend for vegetarians and omnis alike. While Raleigh doesn’t hold the same weight in my mind as Chapel Hill, I definitely came to love lots of during the trip. Plus, getting to see a Philip Glass opera is always good times. I can’t wait to head back to Durham and explore it more, and if I do, I’m making a run to J Betski’s to try everything else on the menu. From farmers markets to the opera to cocktails and meeting up with a good friend, it was one rockin’ weekend and one I hope to put on repeat. Those all sound awesome! SPAETZLE. My youngest brother lives in Raleigh–maybe I should go visit more often (or at least tell him where to go to dinner, haha).